The Backhaul Opportunities Board is a password controlled board hosted over the open Internet by Lafarge - September 2014. The Backhaul Opportunities Board is a password controlled board hosted over the open Internet by Lafarge. 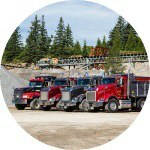 Please refer to lafargehauls.ca for a look at the site. The site was developed using Plone and Python using a backend database in mySQL. The software also functions on tablets and smartphones.